NOTE: For the complete list of AppConfigs and there stock/default values for MSx 9400, click here. The search box is the easiest way to find the AppConfig you're wanting to change. Simply type the name into the box and click Search. This is also a good way to find settings if you're not sure of the name. AspDotNetStorefront tries to make the AppConfig names as relevant to their function as possible. For instance, if you want to change settings for how product ratings work, a simple search for 'ratings' will return the applicable settings. 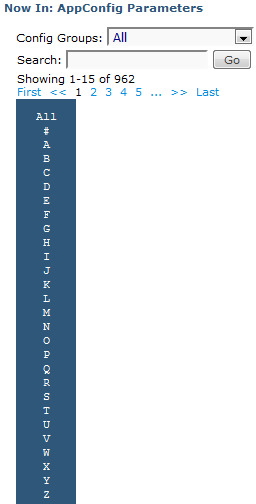 You can also click any of the letters going down the left hand side of the page, and only AppConfigs beginning with that letter will be displayed. Finally, AppConfigs are broken down into groups of settings that affect similar functions - ADMIN, GATEWAY, etc. Choosing a config group from the dropdown list will narrow down the list of settings presented to help focus your search. 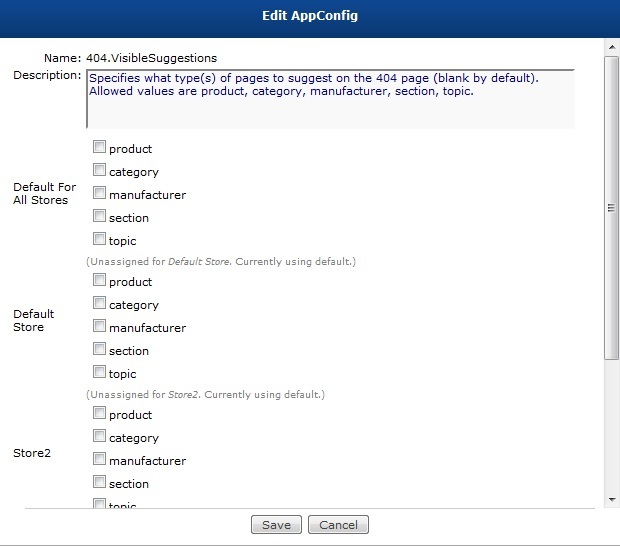 This section is where changes to AppConfigs are made. Be sure to read the description of the setting you're going to change before doing so, to ensure you have a good idea of what is being done. Note that to the left of each AppConfig name, in the StoreID column, you will see the word "Default" to begin with. Each MultiStore install begins with a default set of AppConfigs only. When checking an AppConfig setting, the software will look to see if there is a store-specific copy of that AppConfig. If so, that value will be used. If not, the software 'falls back' to the Default value. 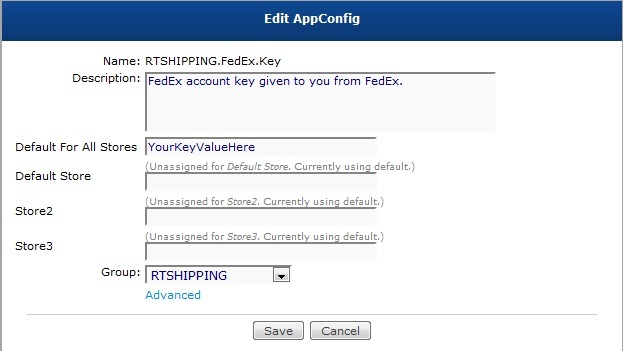 The software will save off copies of that AppConfig for each store so that values can vary from store to store. 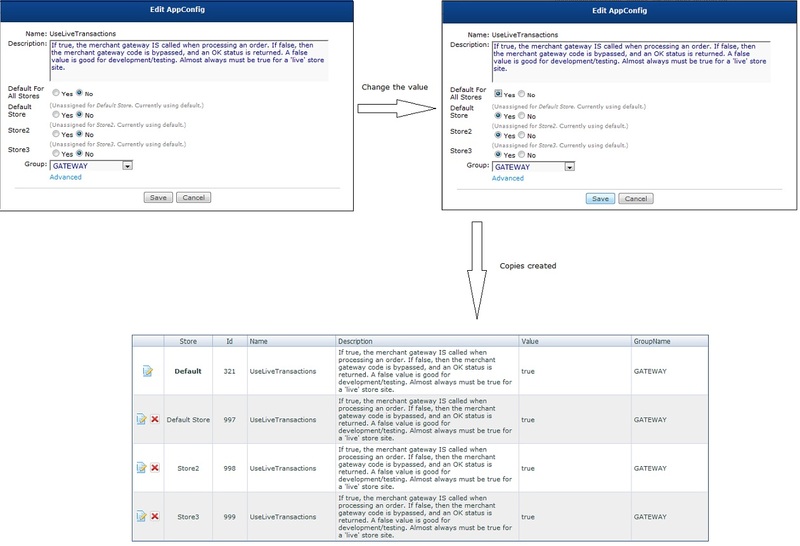 Note that the lookup behavior doesn't change - the software will look for a store-specific value, and if one isn't found it will use the Default value. To make a change, click the Edit icon on the left, and the screen will change (see below). You also have the option to delete an AppConfig, though this should almost never be necessary and can have negative results if you remove a system setting. Change the 'Value' to your desired setting, and then click the Save button. To quit without making a change, click Cancel. You can also change the config group the AppConfig is assigned to with the pulldown menu, or click the Advanced link to see more options (see below). The first advanced setting is the 'Super Only' radio button. Setting this to true means that only super admins will see this AppConfig in the list. Beginning in version 9, AppConfig values are each assigned a 'type'. These types allow technical admins to assign predefined values that are allowable for each AppConfig (if desired). 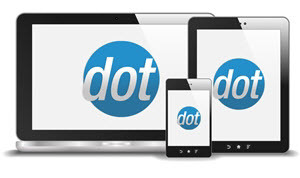 This allows users who are less familiar with the technical side of the software to easily make changes without risking setting something incorrectly. Typed AppConfigs also reduce the number of accidentally mis-set values (for example entering 'flase' instead of 'false'). Boolean Boolean values are for AppConfigs that should only ever be true or false. Integer Integer AppConfigs are for whole values, for example inventory limits. Decimal Decimal type AppConfigs can hold numbers with decimal places. This is a good setting to use for AppConfigs involving dollar amounts. Double This is a good type to use for numerical values that may be set very high. Enumeration Enumeration AppConfigs have a list of allowable values, which the admin can set once and then choose from later. Only one value can be selected at a time. Multi-Select These types of AppConfigs allow admins to set a list of allowable values, but multiple choices can be selected. A good example would be payment methods that are allowed. Dynamic Invoke This type of AppConfig pulls from values set in the code. This type can only be used along with some development work. 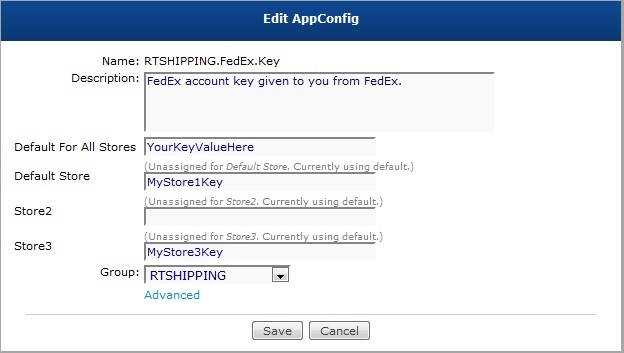 Store admins can also create new AppConfigs, by clicking the 'Add AppConfig' button. Simply fill in the name, desription, and starting value, assign a config group, and set the advanced settings if necessary (see above). Adding an advanced feature that will not be used by the majority of store owners. Additional development work may be necessary for your new AppConfig to have any effect on store operation.